Breakfast in Tianjin is an early and quick affair. However, don’t be mistaken, fast does not mean boring. To the contrary, breakfast in Tianjin is my favourite part of the day. In the past, Tianjin’s economy relied heavily on its docks, so breakfast evolved around the dock workers of the time. Breakfast needed to be fast, filling, delicious and cheap. Work on the docks was very physically demanding, so Tianjin breakfast is characterised by its high salt and energy content, to keep the workers going till noon arrived. Therefore, a good Tianjin breakfast can keep me full from 8am – 2pm without any problems. Breakfast is very affordable, so Tianjinese families have a habit of buying breakfast, instead of making it at home. You can sit down at the many breakfast establishments on your way to work or school and get a filling hot breakfast down in under 10 minutes (if you are a reasonably fast eater). However, one of my earliest memories of breakfast was grandpa waking up early in the morning, hopping on his bike and doing his rounds at our favourite breakfast hawkers buying takeaway. He’d pick up soy milk from one shop, then ride to the steamed bun place and grab me my favourite red bean buns, then visit the fried dough cart in front of our house and get a variety of fried doughs for the family. Actually, taking away breakfast for the whole family is so common in Tianjin that you can bring your own pots, pans and containers from home for the shops to fill up. Nowadays, in Melbourne my day starts with a piece of toast, a boiled egg and a glass of soy milk. It’s a lot healthier, but a lot more mundane. It’s one of the only things I’ve never gotten used to; I miss waking up to the hustle and bustle of breakfast hawkers, awaking my senses with the delicious aromas wafting through the windows and starting my day with a feast. 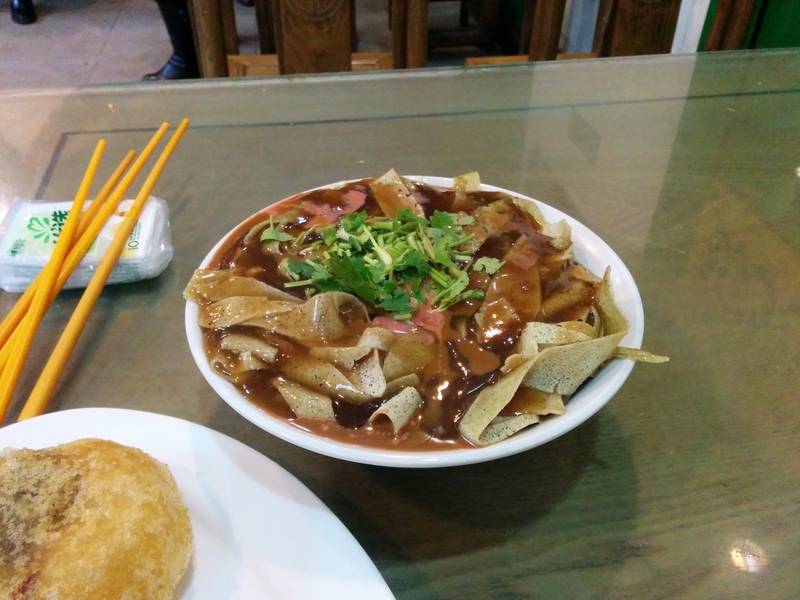 In this post I will introduce to a few of many breakfast options in Tianjin. Let me explain this dish. It is kind of like a pasta and kind of like cereal. Confused? Give me another chance, I promise I will explain it properly. The carb component of this dish is made by spreading a batter that is mainly composed of mung bean powder onto a hot flat cooking surface, forming a large thin crepe. Then the crepe is folded and cut up into strips. On top of this a piping hot savoury sauce is poured. The basic sauce is made with a strong base stock of either chicken or pork bones, flavoured with spices and soy sauce, if you go to a fancier place you will often find shitake mushrooms, bamboo shoots, other fungi, meat and shrimps in the sauce too. This bowl can then be topped with condiments of your choice, normally on offer are: sesame paste, salty fermented beancurd, chili oil and coriander. Why did I say it’s like cereal? Because I like to eat it fast before the mung bean crepe pieces go soggy. Fast and furious, this is a breakfast dish that can even keep the freezing Northern winter at bay. 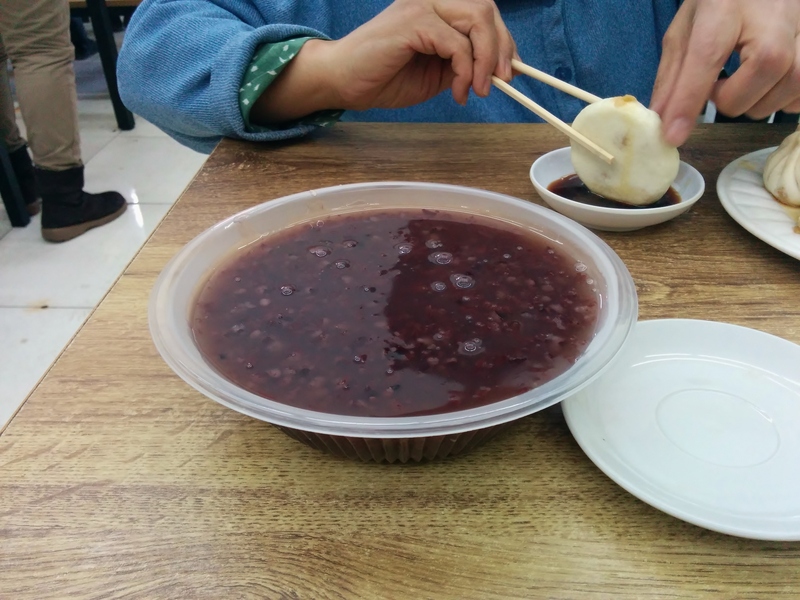 The sauce used to make this dish can also be topped over hot silken tofu to make another Tianjin breakfast favourite. That dish dad can make back in Australia, so we gave that a skip on our visit. As per usual dad decided to order brekky for 4 instead of 2, so once again we had to takeaway. Just to give you an idea of how cheap breakfast is, for 2 bowls of the mung bean crepes; a load of fried dough sticks; 2 pan-fried breads; the small plate of pickles and the 2 sweet pastries only came to a total 17rmb. That is about $3 AUD. I used to never eat dough sticks when I was young and only developed a craving for them after I came to Australia. Now, I love dipping them into the thick savoury sauce that the mung bean crepes sat in. Bread is probably a very inaccurate term for the round discs sitting beneath the mountain of dough sticks. It is a type of half leavened bread that is pan fried on the stove till it is a little bit crispy on the outside and fluffy on the inside. There is many varieties but the staples are plain sesame and a crustier version with the addition of shortening. The two traditional sweet pastries on the side next to the pickles were subpar in quality and not worth a mention. Quality at JinJin has decreased markedly since my last visit, but it is still a good starting point to get a sample of a wide variety of breakfast favourites in one place, otherwise you’d have to travel to a lot more places to get the same variety since breakfast shops in Tianjin normally only specialises in 1 to 3 items. This used to be one of my favourite breakfast items when I was a kid, but this was a special treat food due to how unhealthy it was. Normally made from the left over irregular pieces of dough from making the dough sticks, then it was smothered in brown sugar and fried. Fried dough with caramelized sugar, it may not look the prettiest, but trust me it will get you addicted. This item can be found at most fried dough stations during breakfast hour. This is a very popular traditional sweet bread and another friend from my childhood. Here, they make the best in Tianjin. A perfect crisp sugary crust on the outside giving away to an innard of the richest, most fragrant fluffy centre of sesame paste bread. They sell out very fast, with multiple batches made throughout the day to keep up with the demands, so it is very likely that you will be able to get your hands on a fresh one, still warm from the kitchen. Fresh, warm ones are the best. We normally buy a bag of 10 to take back home to my grandparents, they will normally get finished by the end of the next day. Just look at the layers inside. Oh gosh, I need some now. I left the best to last, this is hands down my favourite item for breakfast. You can buy this at a few shops in Melbourne, they are sufficient to keep my cravings at bay while in Melbourne, but they are nothing compared to the real deal. For one is the key filling -the fried shards, which cannot be found in Melbourne. 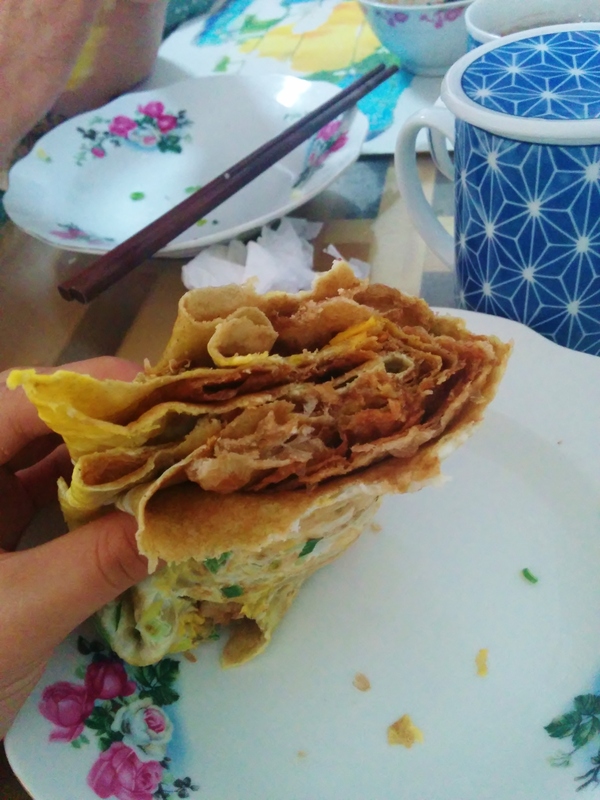 These crepes filled with fried dough sticks are famous throughout China, but the real Tianjinese knows it’s the fried dough shards that you want. 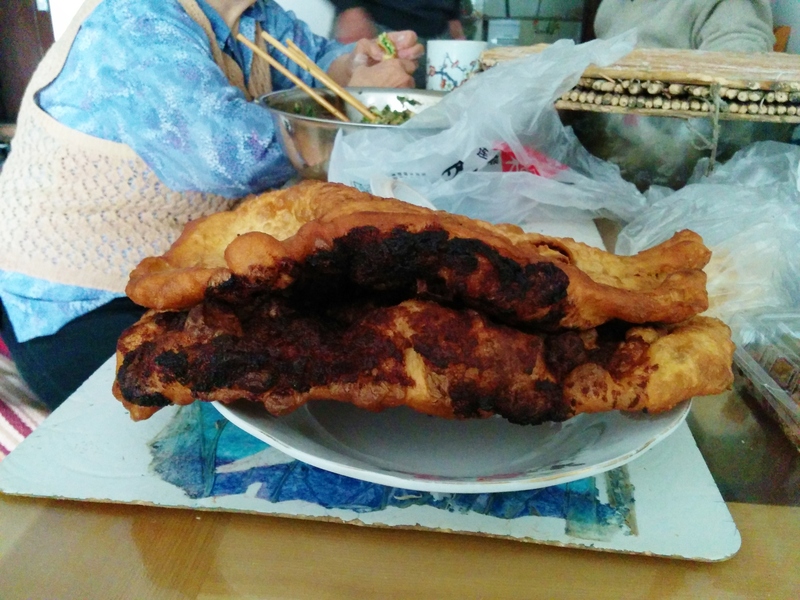 The fried shard is basically a dough that has been rolled out very thin then fried; it is extremely crispy and shatters everywhere with the slightest pressure from your teeth. However, if you want this version instead of the dough stick version then you got to get in early, otherwise it will be very likely to be sold out before 8.30am. Early bird gets the worm. I’ve always loved to see them make this parcel of joy. 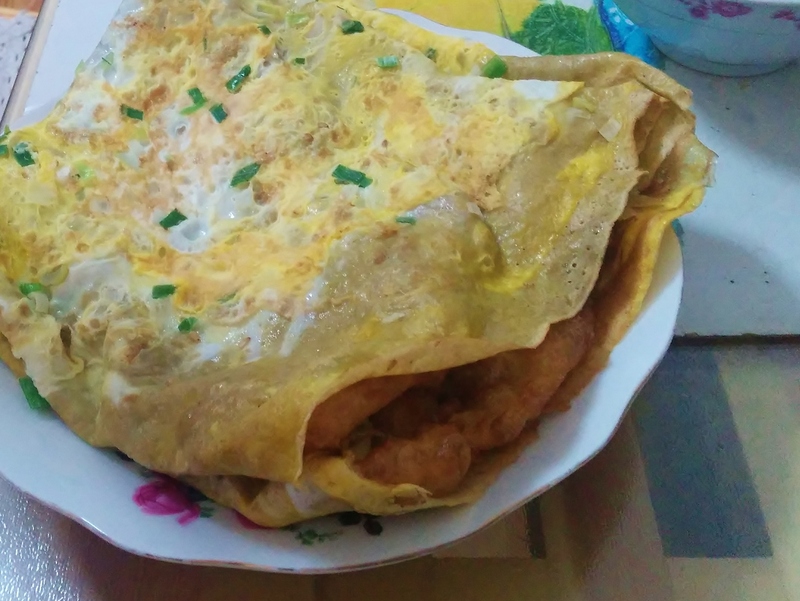 First the mung bean batter is spread thin on the crepe cooking platform then one/two fresh eggs are cracked on top, smearing over the entire surface of the crepe, spring onion is added for flavoured then the crepe is flipped over to add in a giant piece of fried dough shard. At this point the proprietor will rapidly add in a variety of condiments like fermented beancurd paste, hoisin sauce, coriander and lastly ask you if you’d like chili with it. Upon hearing your answer, he/she will expertly fold up your crepe and place it in a paper bag. I love the contrast between the soft eggy exterior and the crispy, shattering insides. 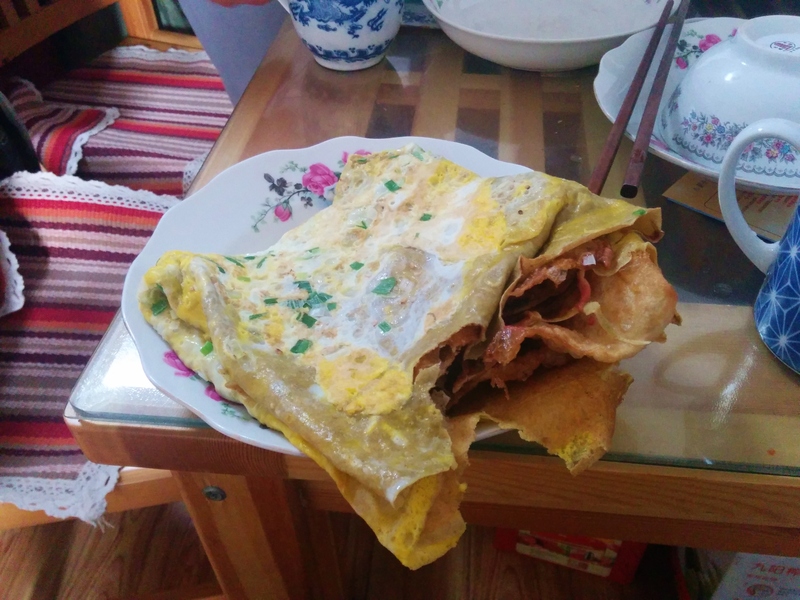 Best of all, you can bring eggs from home for them to put in lowering the price of a 2 egged crepe from 5rmb to 3rmb. A bargain, yummy breakfast to keep you full for a very long time. This traditional breakfast can be found at many hawker carts around the city early in the morning, especially near residential buildings. Until I get another chance to visit my family in Tianjin, I’m sure the many excellent brunch places in Melbourne will keep me preoccupied. Welcome everyone, to Tianjin! This is the city I was born in and where part of my heart will always lie. Don’t ask me to choose between Melbourne and Tianjin, because both cities I see as my home. Funny thing is that Melbourne and Tianjin are sister cities (I know Melbourne has a lot of siblings). Since this is my hometown, so unfortunately or fortunately this is going to be a wordy post. So if you aren’t interested on a little bit of background of the food and the city, just scroll straight down to the first food photo you see and start reading from there. 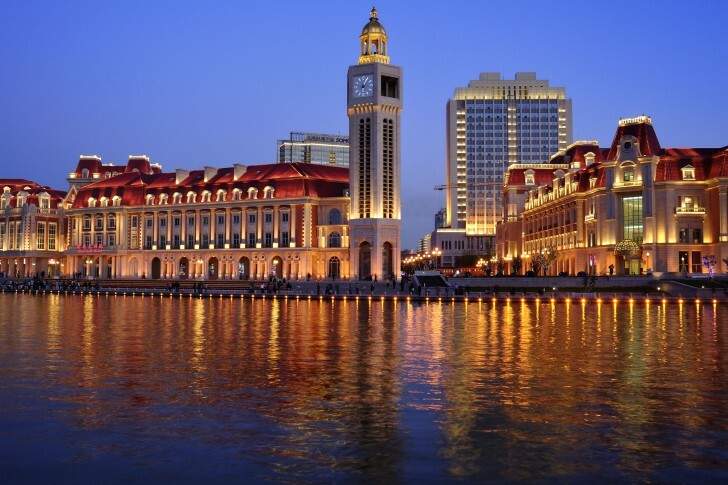 Tianjin, one of the four major municipalities in China, situated only 134km from Beijing. Though to my knowledge, unless you have business relationships with companies in Tianjin, not many people know of its existence. To be honest, it isn’t much of a city for tourism, only recently have they tried to improve tourism in Tianjin by advertising and naming new sites. Plus, for the non-Chinese speaker, Tianjin isn’t an extremely accessible city, because unlike Beijing and Shanghai, English translations for bus stops, subway stops etc. is no where to be found. However, due to the lower prices of quality food and shopping when compared to Beijing, it is quite a popular weekend destination for nearby provinces. So next time you take a holiday in Beijing, brave the language barrier and give Tianjin a shot. It’s only a 40min train ride away from Beijing and with the terrible road traffic in China I promise you, time wise that is a very short journey. Another promise I can make is that the food won’t disappoint! Bao (Buns). 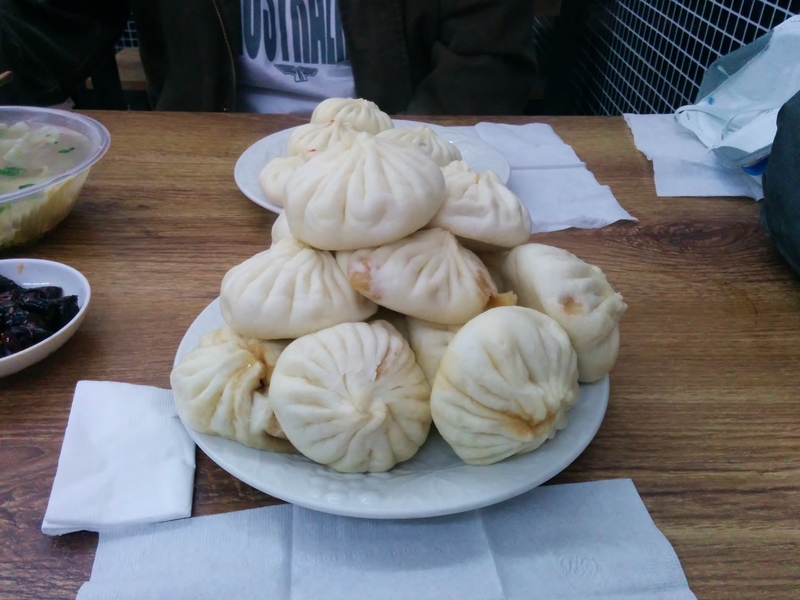 If there is one food that represent Tianjin, it has to be bao. 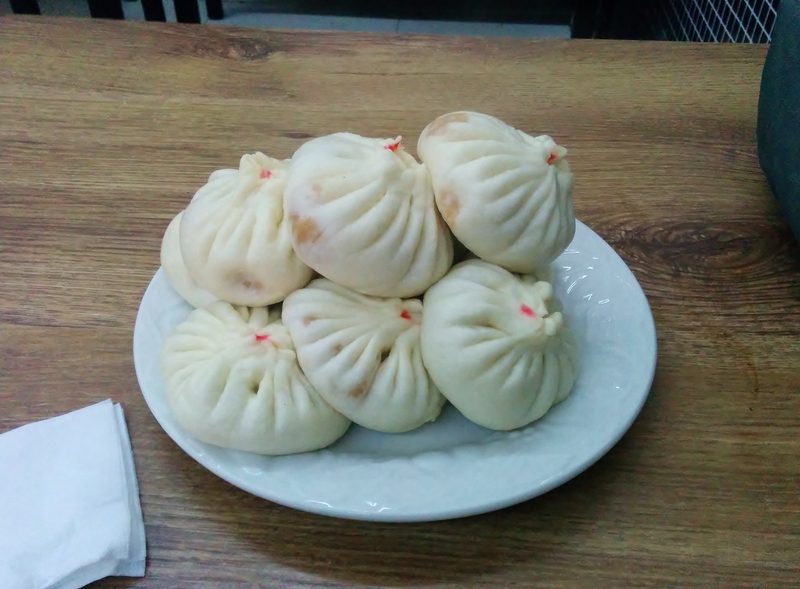 Tianjin baozi, no other kind will do. They aren’t the puffs of clouds that took Melbourne by storm last year, actually I’ve never found the same kinds in Melbourne. To me this kind are the best, though I am severely biased in my opinion. 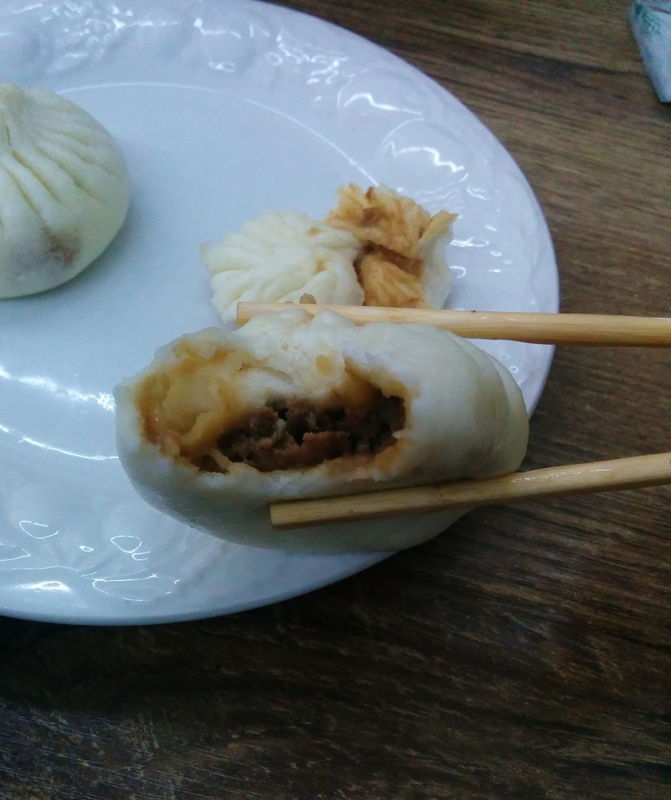 Famous across the whole country is probably Gobuli (Go Believe) baozi, which is a famous traditional eatery in Tianjin. However, like many other famous eateries Gobuli has lost its old lustre through is pursuit for fame and further financial gains, so now it is really only a place for tourists. The locals have moved on to other less famous eateries that has kept to traditions and maintains the flavours of old. So what makes a Tianjin bao unique. First is the skin, it is made using half leavened dough, so in the end the texture is soft, yet relatively thin and chewy. 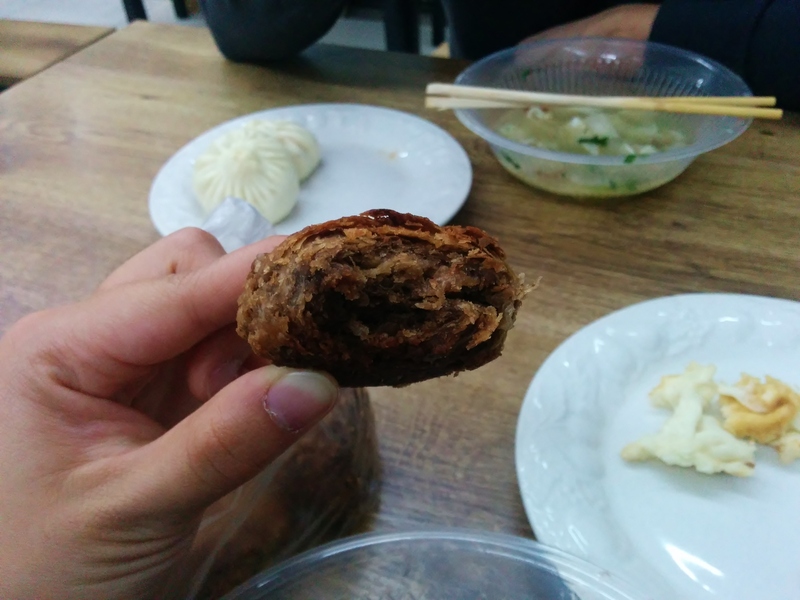 Traditionally, baozi are made from a “seed dough”, this is a fermented dough that gets passed down generations and between neighbours, sort of like how a traditional sourdough is made. After raising, an alkaline agent is added to neutralise the dough, giving it an unique taste. Nowadays, people are making the move to yeast and bicarbonate soda, however at least in my family we are still finding it hard to balance yeast and soda to make the characteristic texture we are used to. Without the seed dough in Australia, we are still searching for that fine balance, but we aren’t there yet. The most traditional filling is probably pork, shops often adjust the proportions of fat to lean meat according to the seasons. In summer the fat:lean ratio is approximately 3:7, whereas in the bitterly dry and cold Northern Chinese winter the fat ratio is upped to 4:6. The name is cumbersome to translate into English, but I think it implies that after eating their baos it will make everyone happy, from young children to the elderly. LaoYouLe (LYL) first opened in 1984 and has relocated several times, now it is situated on the outskirt of a major food complex called Shipin Jie. At one point LYL was a government owned eatery, so it has kept the old operating format. Basically, you order at the counter and the friendly lady gives you some tokens, you take the tokens to the kitchen window and they will hand over your food. There is one more thing I have to explain before we can start eating and that is ordering. 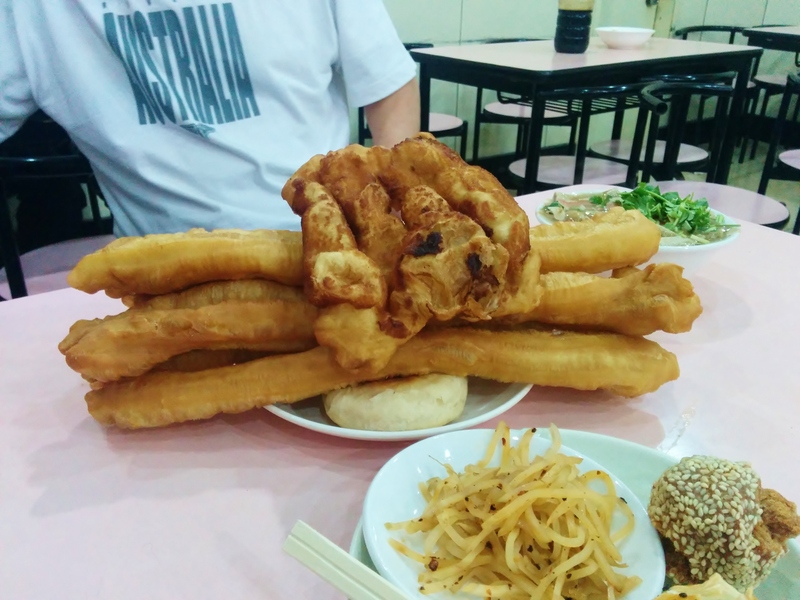 In Tianjin, we sell baos by weight and normally using the Chinese measurement for weight. The conversions is basically 1 jin = 500g, 1 liang = 50grams. For ease of access I will just try to convert everything in this post to metric measurements. Just for a basic idea when ordering, 5o grams gives you 3 baos, 100 grams gives you 6 and so on so forth. I observed some of the customers ordering and by my observations a man normally orders around 100 grams for himself. 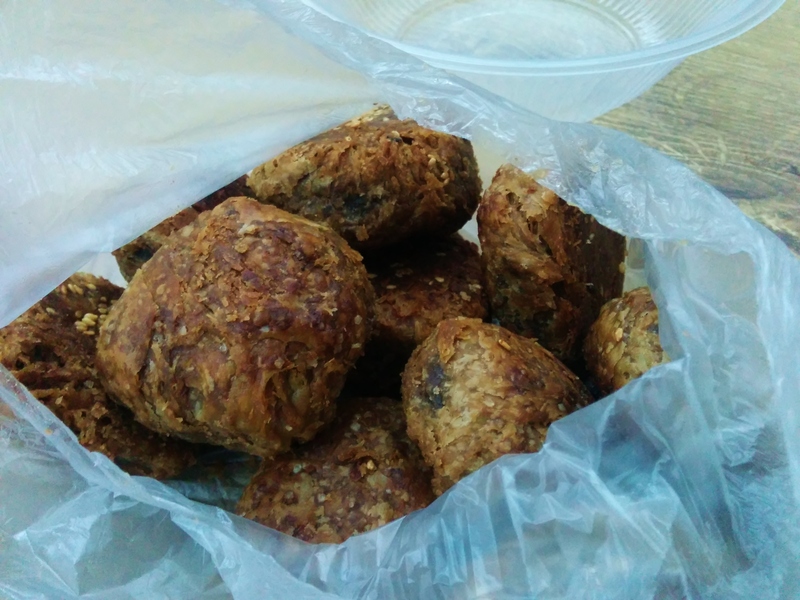 I have a pretty large appetite, so I will eat around 5 baos as well. Like many establishments, baos are steamed to order and at LYL they suggest you consume them within 6 minutes of coming out of the steamer for optimum taste. 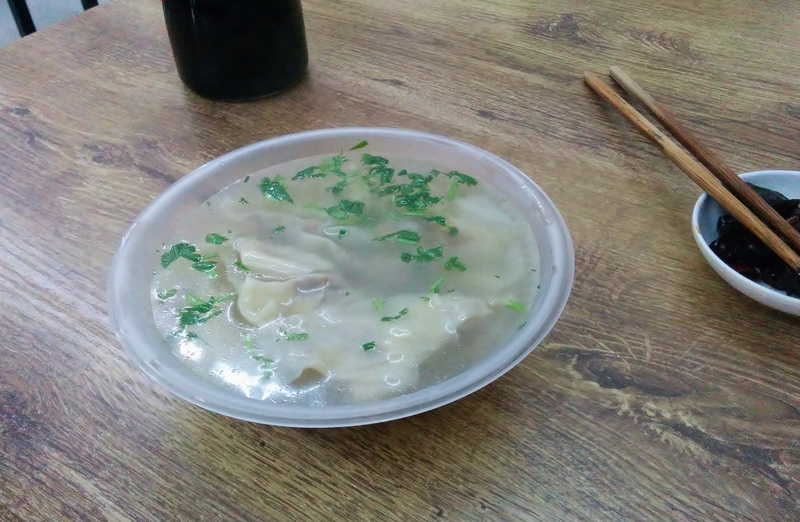 During my stay in Tianjin, we came back to LYL 5 times, either for takeaway or as a quick meal. During our first visit, dad and I had been starved of buns for 2 years and I made the mistake of letting dad take care of how much food to order. So we ended up with 9 seafood baos, 15 pork baos and 2 bowls of wontons. Dad thought we could eat that much, but needlessly to say, he was wrong and we ended up taking away for grandma. With the first bite of the soft skin, quickly drenched with savoury soup, I was home. It is really remarkable of how we can associate taste with memories and for me, this was the taste of home. Pork baos are the simplest staple and simplicity reigns king among my family. The filling isn’t minced, but rather very finely diced, for a more interesting texture then mixed with spring onions, soy sauce and many others to create a rich, savoury filling. Even though, I’d agree that pork baos are the best, I don’t mind a good seafood one as well. Actually, seafood bao is a very inaccurate translation. We actually call it “三鲜” which means “3 umami”, still not clearer? Basically it contains 3 items that are considered full of umami, normally these 3 items would be: pork, prawns and some form of mushroom/fungi. You can order some liquids with your buns, normally there are 3 options available: congee, wontons or a simple soup. Hospitality is old style here, you can bring your own bowl and if you want to take away you can even bring your own pot to takeaway for the family. My dad has always had a strange request when I make his wontons. He always wants small filling, actually not just small but tiny. This makes me confused every time, because isn’t the bigger the filling the better? But this bowl of wontons explains it and this was the type he was used to growing up. I would say this is a different style of wontons to the ones I’m normally used to eating. Despite having the tiniest filling these wontons were so full of flavour. I can assure you, that when I make wontons at home with tiny fillings they taste horrible, but these ones tasted very nice indeed. Strange. 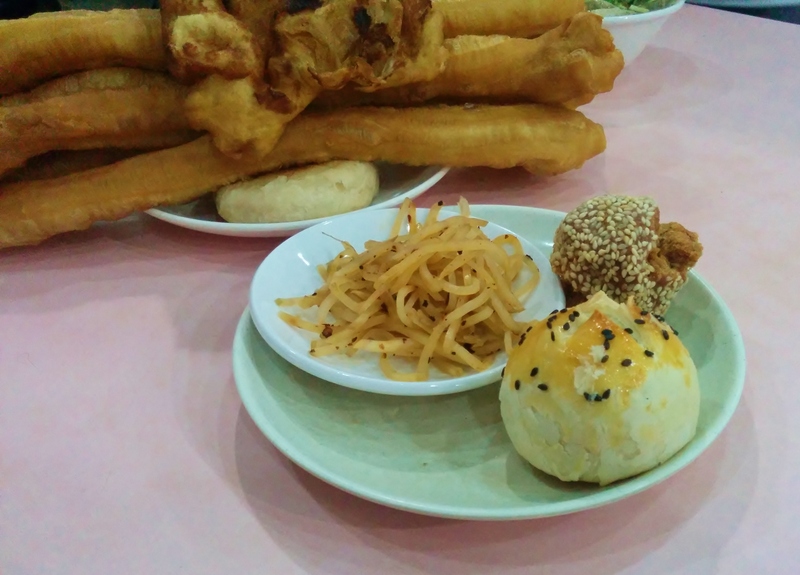 I would say that baos are a simple staple for us Tianjinese, they are fast and delicious. To me, this is what fast food should be like, no maccas, no KFC, but baos and plenty of them! But more than any of that, this is the food item I associate with home and home I was.